Lock in a great price for Golden Marigold Hotel – rated 9.1 by recent guests! Great place to stay. Small guest house with lots of charm and extremely nice and helpful stuff. Perfect and clean. Towels and all amenities well prepared. Even had rose pedals on the bed - too bad I wasn’t with my wife. staff was very good, Mr Saurabh was very kind and helpful. Best place to stay in jaiselmer. The staff is incredibly helpful! They picked me up at bus station. And despite me booking only one night (I had an overnight train) they nicely kept my luggage, and let le rest for an hour in an emtt room before driving me at the train station. Than you so much! The staff was really sweet and helpful. They always asked us how we were doing and we had good conversations about the area and their history. We made a last minute decision to take a camel into the dessert and they helped us out. The bed was huge and super comfortable. They held our bags and picked us up from the train station. Great service and a great stay!!!! The water was hot (but make sure to schedule a shower after 8:00). One of our best sellers in Jaisalmer! Featuring free WiFi, Golden Marigold Hotel offers accommodations in Jaisalmer. The hotel has a terrace that overlooks the fort. Every room includes a TV to relax in after a busy day. Rooms are equipped with a private bathroom. 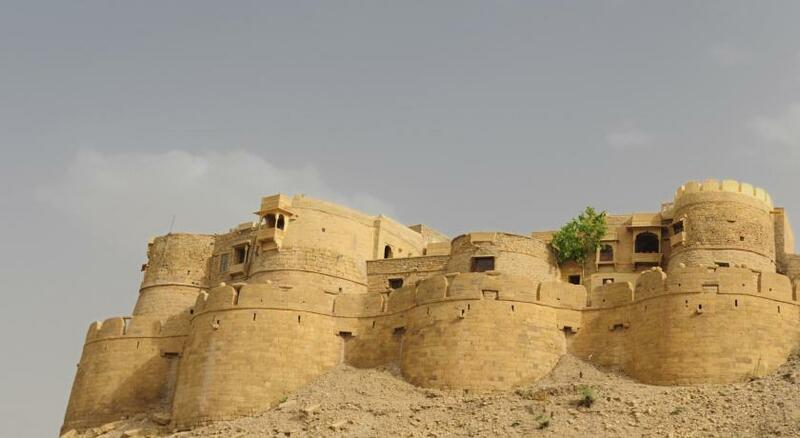 Jaisalmer Fort is 350 feet from Golden Marigold Hotel, while Patwon Ki Haveli is 1,300 feet away. When would you like to stay at Golden Marigold Hotel? This double room has tile/marble floor and cable TV. The property is very clean and rooms of a high standard. We are very close walking distance to the fort. We can arrange your food, camel safari, walking tours and much more. House Rules Golden Marigold Hotel takes special requests – add in the next step! Please note that the property requires a booking deposit of 50% of the booking amount to be paid after booking. The property will contact the guests with transfer details. However, if the guest fails to transfer the amount, the property reserves the right to cancel the booking. Please inform Golden Marigold Hotel of your expected arrival time in advance. You can use the Special Requests box when booking, or contact the property directly using the contact details in your confirmation. Such a comfortable bed and pillows! Sammar and Sorab were amazing hosts, available to prepare great food and help with our enquiries. Located five minutes away from the fort, but with a nice view from the fort on the rooftop. Would recommend staying here. Hot water, comfy bed, very clean, fantastic staff. Very lovely and helpful staff! Rating score does not quite reflect the reality.. it is more of a basic hotel, probably deserving more of a 7.5 review score The decor was quite tasteless - it would be more effective to provide a fresh, clean, basic space. Was asked to leave a review on my departure which is something I don’t enjoy. It makes me want to leave a very very honest review... good or bad. Great location just a few minutes walk from the fort. Nice clean room. Lovely kind & helpful staff - from the free pickup from the railway station when we arrived, to letting us relax in the communal areas after checkout when we had a late train, to having put the hot water on for us to wash after we came back late from a camel safari. We loved staying here but it was a bit chaotic.This did not spoil the enjoyment and staff were very keen to help, just forgot sometimes. Very nice area to eat and chat in upstairs. Staff were extremely helpful. They allowed us to check out the night of our camel safari and check back in the next morning, to use the room before our night bus. Very short walk to the fort and main part of Jaisalmer. Excellent value for money. Simple, clean, comfortable, extremely helpful staff, great location near the fort.